We have reviewed, rated and compared Goodman air conditioners so you can buy with confidence. These AC’s are not for suitable for everyone so check to see if they fit your needs! The idea of a warm summer evening with a cold one in hand is relaxing to think about. However, those summer evenings don’t come without their own complications. Not long after the season begins, temperatures start becoming unbearable to the point where spending even a minute under the scorching sun becomes difficult. The perfect solution to this problem is getting an air conditioner installed, to keep you fresh and cool even in the blazing days of summer, and equally cozy in winters. According to the Department of Energy, more than three-quarters of all houses have air conditioners and use about 6% of all electricity produced. There are many air conditioners out there that can fulfill your cooling needs efficiently and reliably, and here, we will discuss one of the leading air conditioning brands, Goodman Air Conditioners. Since every AC is not the best fit for everyone, our buying guide and comparisons can help you understand which one may suit your needs best. Goodman air conditioners are a good choice if you live in hotter environments, and want efficiency and comfort at a low cost. With Goodman air conditioner’s warranty and excellent tax rebates, it is the prime product in its price range. However, keep in mind that there are more efficient options for people willing to spend more. If you’re thinking of going for one of Goodman’s air conditioners, it is advised that you consider the GSXC16 or GSXC18. This is because they have a number of useful features, and will cost you less in the long run compared to the much cheaper GSX16, GSX14 or GSX13. Additionally, with the tax credit you get from the bigger AC units, the price drops down even further! The bigger units’ price tag might seem daunting at first, but it all pays off at the end, giving you more comfortable, relaxing, and economical summers altogether! Goodman AC units are one of the highest quality ACs with their primary focus on efficiency. It has five different models you can choose from, depending on your budget and needs. After incurring the initial purchase cost, you need to consider the running cost of each unit. It depends largely on how much electricity it is going to use, which is directly proportional to the location and the size of the room. An AC unit in hotter regions will run more often, and therefore use more electricity. Similarly, the bigger the room, the more your unit will have to work in order to regulate the room’s temperature, though this problem can be tackled by buying a unit proportionate to the room size. Following is a table that shows what size AC unit is best for what room/home size. First, check the unit’s size and SEER rating. For example, a 16 SEER, 2-ton AC will use approximately 15 amperes, 3-ton AC uses 18 amps, and a 4-ton AC uses 21 amps. Next, you’ll need to calculate the wattage your unit consumes. A normal residential Goodman air conditioner uses a 240V power socket. Multiply the amperes by your wattage. For a 2 ton AC, 15 amps x 240 watts = 3,600 watts. To find your usage (kWh), divide the answer by 1,000, i.e., 3,600 watts / 1,000 = 3.6 kWh. Multiply this to the rate of kWh unit in your state. For example, in New York, the cost is 21.0 cents. So, 3.6 kWh x 21.0 cents = 75.6 cents per hour. Tonnage makes a huge difference in the running costs and cooling capabilities of an AC unit, and so does the Seasonal Energy Efficiency Ratio, or SEER rating. We shall discuss the SEER rating later on. Goodman has a SEER rating of over 14, making it one of the best brands of central air conditioners in the market. Although it might be tempting to grab your tools and try to install or repair your air conditioner to save money, even the slightest mistake in the installation process might end up costing you a lot more than even the most expensive HVAC contractor. There are also chances that you might void your warranty by doing something that isn’t covered under it. Remember, a good install can mark the difference between a 5-year or 15-year lifespan of your unit. HVAC units aren’t just plug-and-play, and that is why HVAC contractors receive considerable training before they are certified to install these units. They aren’t able to graduate unless they have a thorough understanding of the mechanics of HVAC systems. You can hose down your unit’s condenser and coils, change air filters, and check water drain pipes of your unit yourself, but these tasks are not enough to keep your HVAC system running in top working conditions. Hiring an HVAC contractor can not only help you install your unit in the proper way but also ensure that your currently installed systems are operating efficiently. 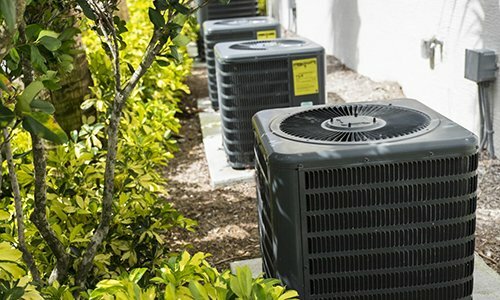 To find a good contractor for your new or old HVAC contractor, you can visit Modernize.com through our questionnaire below and get a list of contractors near you. Modernize lists contractors based on their success and ratings. The website also screens all these contractors for you so that you don’t end up with the wrong end of the stick! As mentioned above, Goodman has several different models of central air conditioners, each with its own features. Following is a brief explanation of what the different models offer. The G in GSXC signifies the Goodman brand same, S shows the product category; a split system, X signifies the unit type, i.e., a condenser, the C shows the unit’s communication feature meaning whether it is able to control itself automatically or not. Here, it includes an integrated communicating ComfortBridge™ technology, and the figure 18 signifies the unit’s SEER rating. The GSXC18 is Goodman’s most efficient air conditioner; easily affordable and gives you better control over cooling levels. In the long run, the GSXC18 gives a much better performance compared to the rest of Goodman’s air conditioners. GSXC16 is similar in every aspect, except its SEER rating is lower. Customers who have purchased the GSXC18 or 16 are pleased with the product’s cooling capabilities, especially its quietness. It is also much more energy efficient due to its ability to make automatic adjustments to reduce energy usage. These models lack the ComfortBridge™ communication technology. This means that the unit will not be able to automatically make adjustments to the AC to minimize the amount of energy used. This results in more electricity usage. Following is a list to explain the differences in models better. We have mentioned the SEER rating a few times already. Let’s get into what it is and what it means for your AC usage and energy bills. The Seasonal Energy Efficiency Ratio, or SEER, is the rating given to air conditioners, heaters, and refrigerators based on their efficiency. The SEER rating of a unit can be simply described as its cooling output during a typical cooling-season, divided by the electrical input during the said period. The higher the SEER rating is, the more energy efficient the AC is. To put it in even simpler terms, the SEER rating is the ratio of cooling in British thermal unit (BTU) to the energy consumed in watt-hours. SEER rating was introduced in 2008 by the Air Conditioning, Heating, and Refrigeration Institute. Goodman Air Conditioners differ in SEER rating, as mentioned above, and the best in that regard is the GSXC18, then GSXC16, GSX16, GSX14 and lastly, GSX13. There are many other brands such as The Carrier Central Air Conditioner, Lennox Central AC, Amana Air Conditioners and a few others that are better in regards to SEER rating. Here is a detailed comparison between different air conditioning brands and their SEER ratings. When looking for a Goodman Air Conditioner for your home or office, following are some considerations you should keep in mind. A compressor is like the heart of any air conditioner – expensive and important. Compressors enable your unit to cool the room. Single stage compressors run on high speeds to cool the room and turn off once the desired temperature is achieved. When the room gets warm, it turns on and begins cooling again. These are usually quick to cool the room but can result in higher electric bills and fluctuating temperatures. Two-stage compressors cycle between high and low speeds. They run on high speed and slow down once the desired temperature is achieved to ensure that the temperature remains consistent. The electric bill is lower with these compressors. Goodman AC compressors come in both types. The GSX13, 14, and 16 have one stage compressors, while the GSXC16 and 18 both have two stage compressors. A condenser fan motor is usually located within the condensing unit, in the outdoor unit of your air conditioner. The compressor and condenser coil are also in the outdoor unit. The purpose of a condenser fan is to keep the condenser cool when it is running. The condenser fan motor turns the fan blades, which blow air across the condenser coil, cooling the refrigerant to turn it from a gas into a liquid. 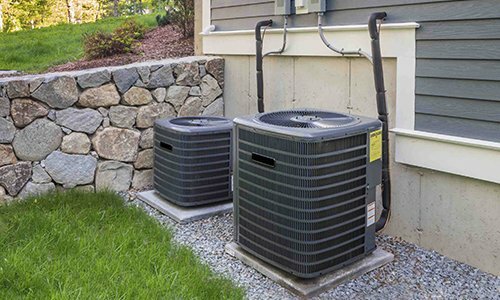 A well-maintained condenser fan motor is key to prolonging the life of your AC’s compressor. Goodman’s GSX16, GSX14, and GSX13 have single-speed condenser fan motors that turn off once the desired temperature is achieved, turning on again when the compressor turns on. The GSXC18 and GSXC16 Goodman air conditioners feature high-efficiency two-speed ECM condenser fan motors to properly cool the compressor, which in turn works more efficiently. The fan slows down once the desired temperature level is achieved, conserving energy in the process. Most air conditioners also have the option of heating, hence the name HVAC (Heating, Ventilation, and Air Conditioning). Just as the compressor is responsible for cooling the air that goes through it, it is also responsible for heating it. For cooling, the condenser turns the gas into a cold liquid with the help of pressure, for heating, it does the exact opposite. The gas gets hot when pressure is not applied. When air passes through coils containing this hot gas, it gets heated, and thus, your air conditioner acts as a heater. Goodman’s air conditioners perform equally well as coolers as well as heaters. When looking for an HVAC system, you should be careful of how much noise the system makes. It is impossible to avoid air conditioner noise, but it can be minimized with the help of insulators, such as rubber or other noise absorbents. The design of the unit also plays a major role in eliminating the noise air conditioners emit. The usual source of noise is the compressor’s vibrations. Typically, an air conditioner has a noise range of around 40 dB to 60 dB. Some quieter AC units can go as low as 25 dBs as well, which is slightly louder than a whisper. Goodman’s AC units are known to make a little noise, but it’s considerably lesser than many other brands. Their noise scale ranges from 40 dB when functioning normally, to up to 70 dB when under stress. The loudest units are the GCS16 and GCS13, while the GCS14 and GCSX16 make a little less noise. The GCSX18 is considered to be the quietest air conditioning unit Goodman has to offer. However there are quieter units available in the market as well. Although the whole unit has a warranty, some AC parts have different spans of warranty. If that is the case, they might not be included in the unit’s warranty, as a whole. Air conditioner manufacturers, Goodman and Amana, both offer lifetime warranty on their units which is considered the best central air conditioning warranty in the market. Other HVAC manufacturers offer warranties ranging from 5-10 years, varying in components covered. Warranties are important because if a certain component ever malfunctions, it might end up costing you a lot more in repair, in addition to being an inconvenience in its own. A warranty can save you time, money, and give you peace of mind. Goodman AC warranty includes a lifetime compressor warranty, 10-year unit replacement warranty, and a 10-year parts warranty, which makes it one of the best deals in the market. Since air conditioners fall under heavy energy equipment, most governments offer tax credits as incentives for buying high-efficiency equipment. This means that by buying a more efficient air conditioner, you not only save on your utility bills but also on your taxes! Buying Goodman air conditioners (split) with SEER rating equals to or greater than 16 or EER (Energy Efficiency Ratio) above 13 can render you eligible for a tax credit of up to $300. For package systems, the threshold is lower, i.e., with a SEER rating of 14 or more or an EER rating of 12 or more. Established in 1982, Goodman has managed to earn a significant share of the market, primarily due to its low prices, good quality, and excellent warranties. It is now headquartered in Houston, TX with four manufacturing plants in the US. However, every AC brand has its own pros and cons, and Goodman air conditioners are no exception to that. Goodman air conditioners are wholesaled to any HVAC installer that can buy them. This has allowed some inferior installers, who haven’t been factory-trained, to enter the market. Goodman is the best fit for people who want a good bang for their buck, as its units are easily affordable. Although nearly perfect for people in hotter environments, there are some other, more efficient alternatives that you can look into. The lengthy and trustworthy parts and unit replacement warranty, and the lifetime compressor warranty are the best in the market, which is a sell for most people. If you are looking to upgrade to Goodman’s more efficient models from a relatively poor SEER rated conditioner or an older one, simply follow the steps below!